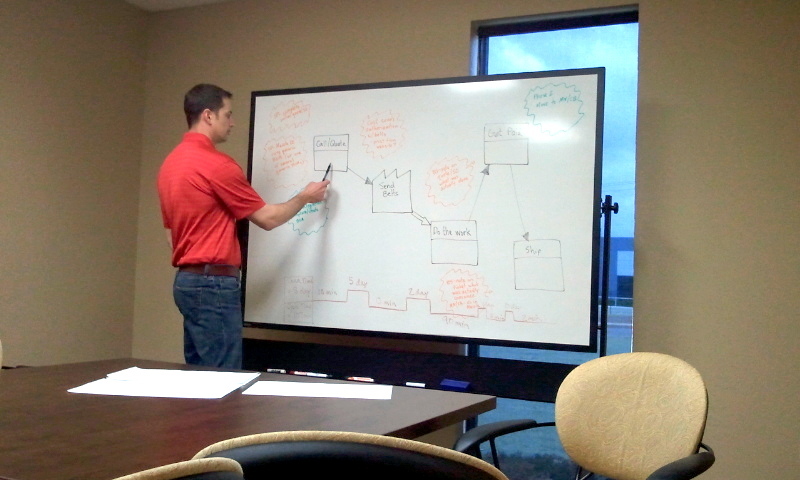 This is a picture of our Director of Manufacturing mapping out a more efficient process for doing refurb and re-webbing projects for Seat belt Doctor(TM). Some companies out there receive these belts and promise to turn them around in 24-48 hours. Let me assure you, it takes a LOT more work to properly evaluate a seat belt that's been pulled from someone's vehicle than 24 hours will allow. Now we also realize that when you've sent us a seat belt from your daily driver, you need a quick turnaround. In these instances, we work very hard to accommodate that need. Because of our thorough evaluation, we are able to alert the customer that other problems exist within the seat belt that needs attention. Still again, there are times when we graciously return the seat belt because it cannot be refurbished safely. In some cases, we refer the potential customer to a dealership. It's far more important to us to solve the customer's problem than to sell you something we shouldn't or that you can't use. There's no debate on this issue for us! However, in the VAST majority of cases we receive the seatbelts, do the work promised at the price promised, and turn them around ASAP. Give us a call or email us if you have any questions!